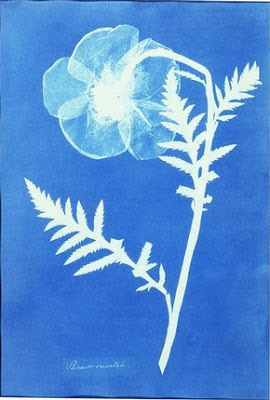 Remember Atkins's Papaver Orientale, aka Poppy, from Cyanotypes of British and Foreign Flowering Plants and Ferns (1854) ? 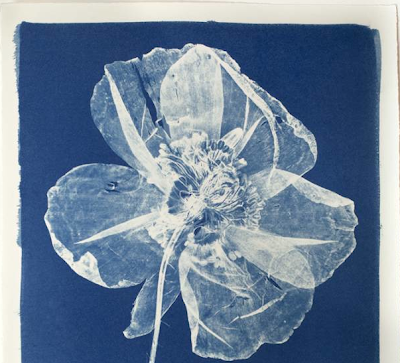 When I saw London-based graphic designer and artist Henrietta Molinaro's contemporary cyanotypes, I thought of her 19th century predecessor, Anna Atkins, the woman widely acknowledged to be the first female photographer. 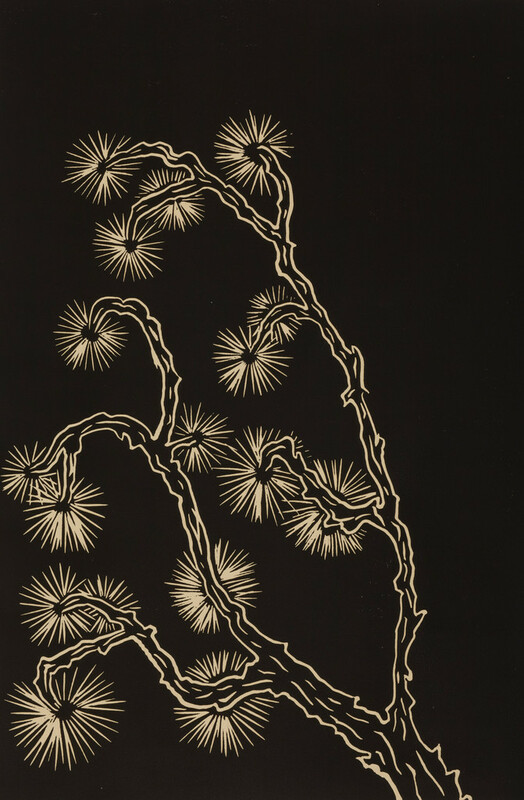 (And in fact it was photog Miguel Flores-Vianna who introduced me to Molinaro's work.) 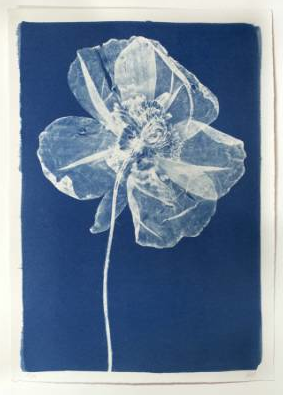 See how Molinaro opts to isolate the bold hand-picked and pressed poppy so that the sheer, floppy petals fill the space? 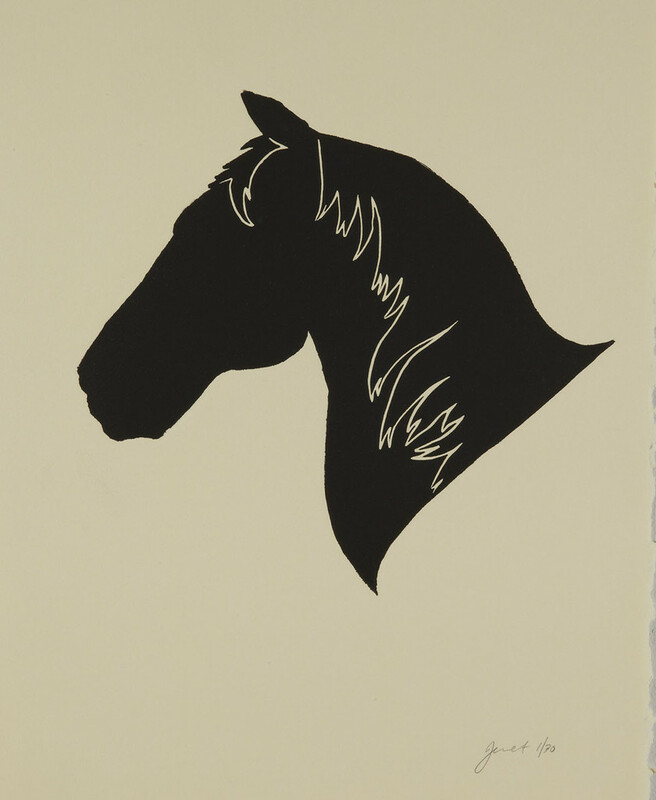 This summer her work is on view in London at Wilson, Stephens & Jones. Find more here, here and here. Yumiko Kamada, assistant professor at Waseda University, Japan, and a recent Scholar-in-Residence at Shangri La, has spent a lot of time researching Deccani carpets that ended up in Japanese collections. 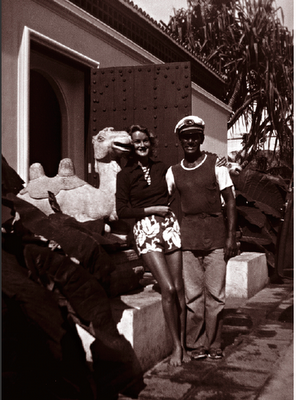 She also explores pieces in other locals around the world, such as Doris Duke's Hawaiian house. 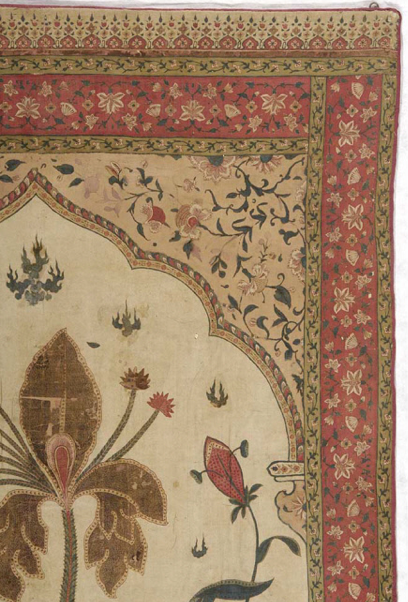 A few months ago, Kamada presented a paper on Duke's holdings, focusing not just on Indian carpets but embroidered and painted Deccani textiles, too. Since the lecture is illustrated with some wonderfully inspiring pieces, I'm sharing a link to the full talk. If you find yourself on Atlanta's Westside anytime soon, take a peek at the Howell Mill Anthro's latest window. The creative team has done an installation that, in an abstract way, might transport you to the top of a crashing big blue Endless Summer-esque wave. 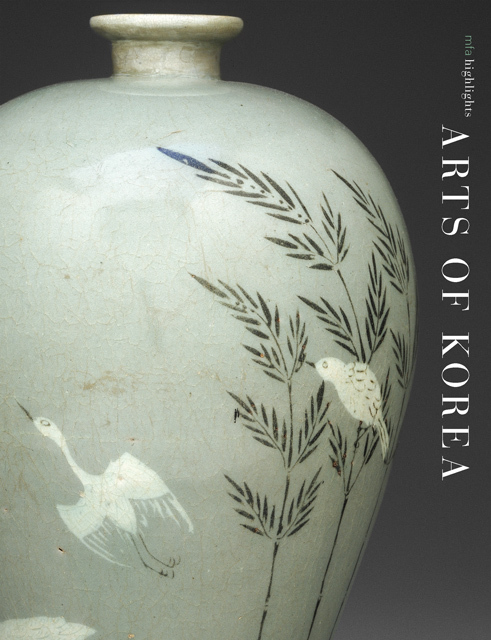 Accessible to everyone is the MFA's e-book, Arts of Korea. 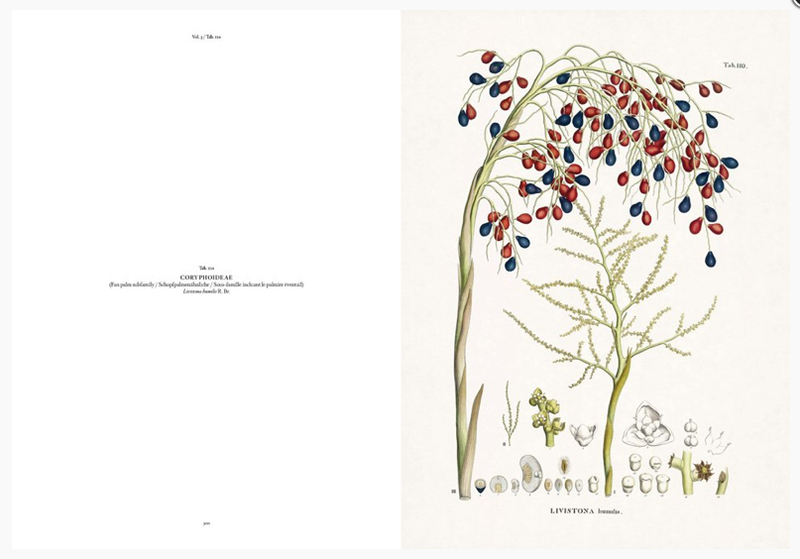 From now through August 1st, the well-illustrated publication can be downloaded for free. 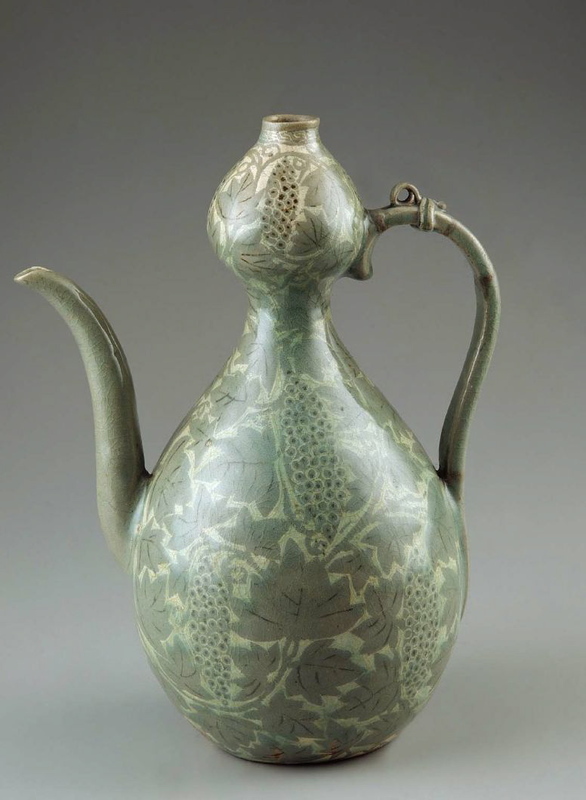 Turning the pages of the catalogue and enjoying the 360-degree view options in the electronic edition, I thought about showing only pieces with a sea motif but in the end decided this vine-covered, inlaid and celadon-glazed 13th-century Goryeo dynasty ewer was a must-see. 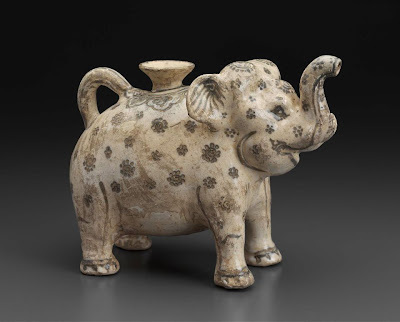 It's just one example of the MFA's stellar ceramics collection. 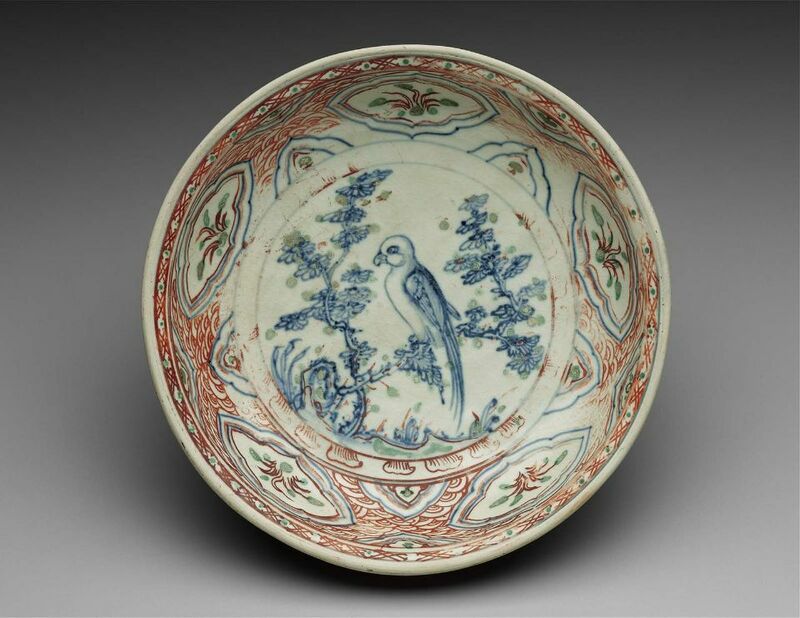 Some do see fish in the decoration of this contemporary stoneware plate by Shin Sangho. The Museum points out that Sangho references centuries-old Buncheong ceramics (note the purposely rustic feel of his object) but makes his own mark, literally, with brush painting, stamped slip decoration and incising all used together in a way that suggests Abstract Expressionism. In addition to pottery, Arts of Korea explores ink painting, Buddhist art, mirrors and lacquerware. 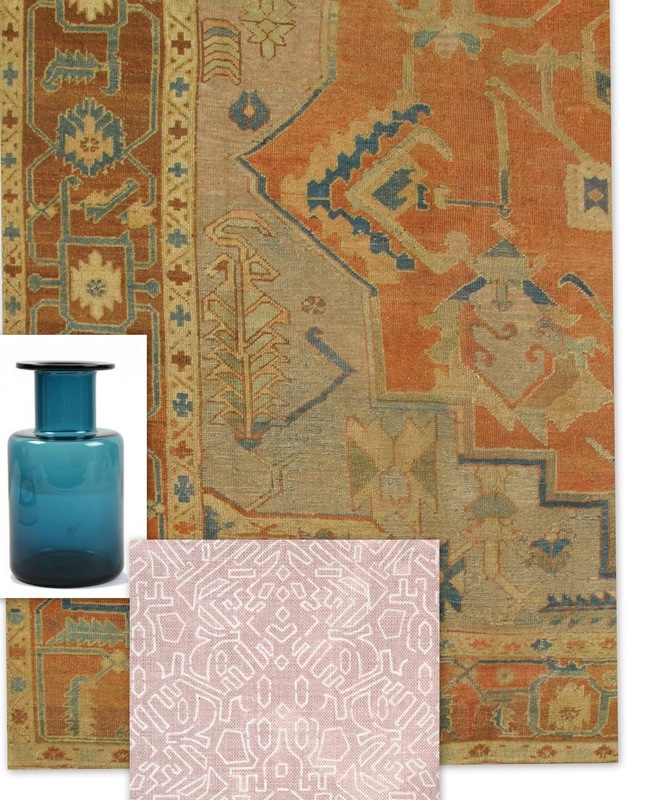 By now you probably know the story by heart: While visiting India during her round-the-world honeymoon in the mid-1930s, Doris Duke fell for (or, as Linda Komaroff speculates, built upon a pre-existing passion for) Mughal design. This curtain is one of ten panels she commissioned not long after. They were destined for Shangri La, her modernist house in Honolulu, and Duke installed them to create a tented interior in her Playhouse. Currently you can see this example up close at the Norton in Palm Beach as part of the previously discussed exhibition, Doris Duke’s Shangri La. The show continues through July 14. Next stop: The Nasher. It's summer. Time to break free. Get in the spirit with Kathryn Ferguson's short film of wild horses, and check out horse-related embroidery in Chloe's archives here. Artist and printmaker Jennifer Ament's full menagerie of beautiful creatures can be seen here. As anticipated, postcard repros of Rachel Ruysch's Vase of Flowers, 1700, are among the goods on sale in the High's new pop-up Girl gift shop. Touring the loan exhibition of Dutch works from the Mauritshuis (pieces that celebrate everyday, mostly domestic activities), I kept circumventing other gallery visitors to take second and third looks at a tiny Gerard ter Borch painting with an interesting palette of nuanced colors: a splash of pale peachy-pink, a dot of brilliant turquoise-y-blue, and a hit of rich coral-red all set off by dark, muted, earthy tones. 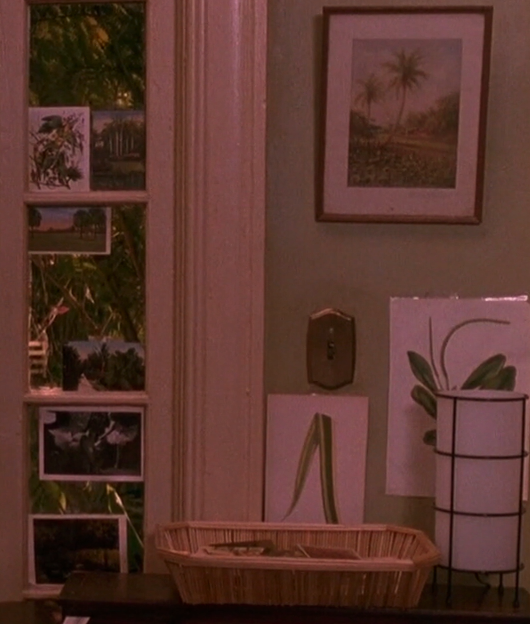 That's the color lesson of the show, I think. How sorbet hues and jewel tones shine when juxtaposed with murky shades. 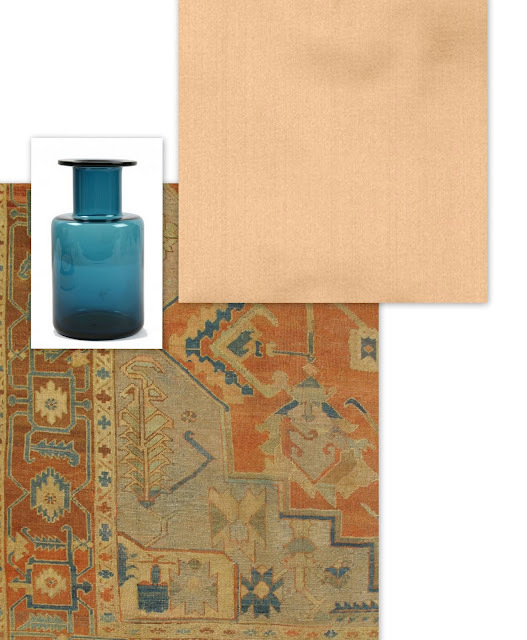 So I pulled together some inspiration boards based on what I observed in ter Borch's work. 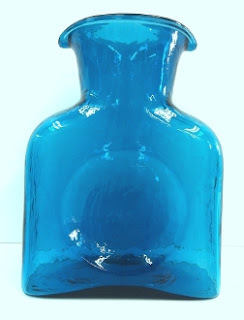 First, just a late-19th-century Serapi from Keivan Woven Arts, a small blue bottle from Ben Pentreath and the color Vintage spotted over at Duralee. 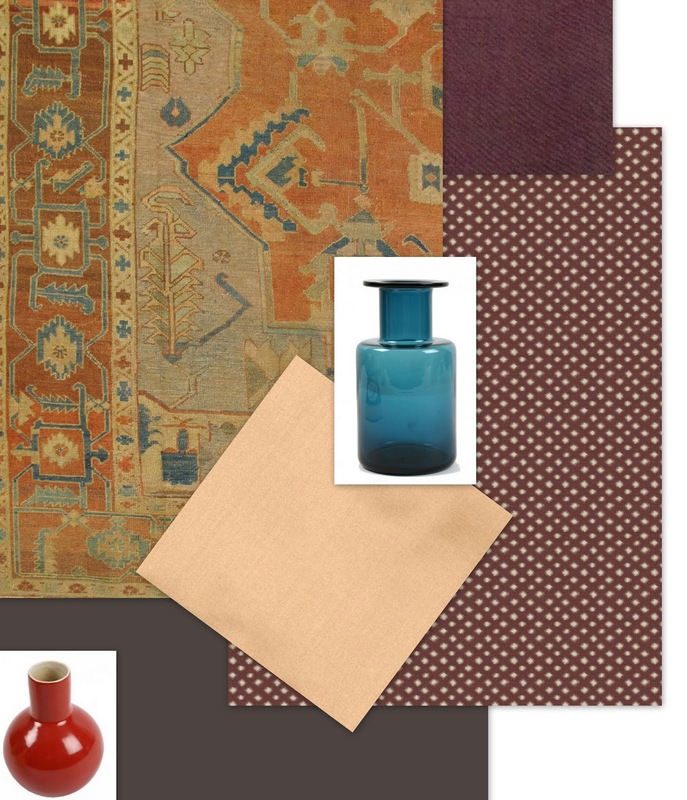 Next, as an experiment, I mixed in Nate Berkus's all cotton Euclid Plum, another plum linen from Lewis Sheron, Benjamin Moore's Espresso Bean, plus a persimmon bottle from Pentreath. Zak + Fox's Katagami in Mountbatten has already been posted here a couple of times -- and the mauve-y pink isn't pulled from the painting -- but I had to try it with the rug and blue bottle. For blue glass crafted in the U.S., West Virginia-based Blenko is always a great source. 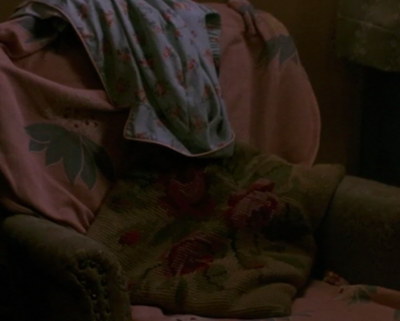 After you've toured Girl with a Pearl Earring, don't forget there's more color inspiration to be found in the film. 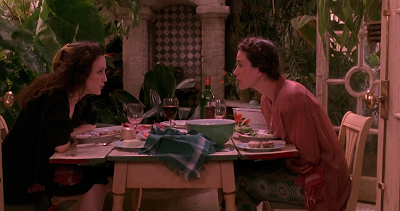 The High is screening it on select Saturdays this summer. But if ethereal greens and blues with crisp stripes are your thing, check out the Cheerful in June post. 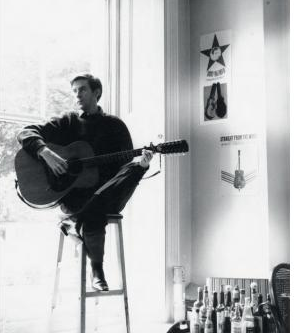 Almost Famous blues can be seen here. 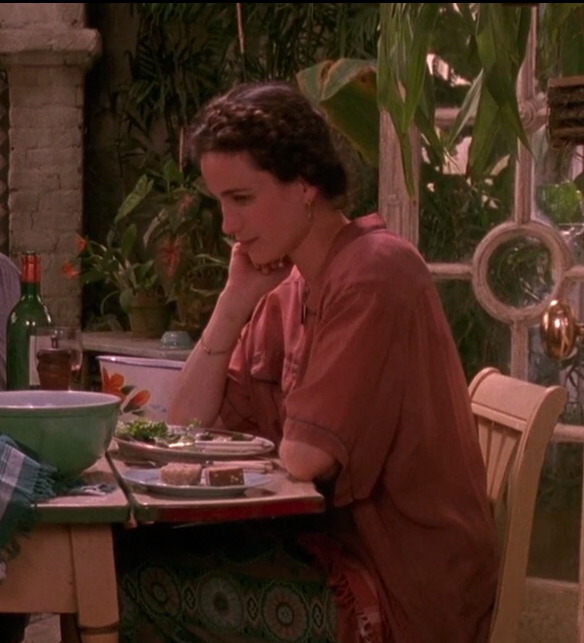 In early 1990s Green Card, horticulturist Bronte (played by Andie MacDowell) lives surrounded by plants -- fresh flowering and non-flowering varieties in her much-coveted apartment greenhouse, on her terrace, and throughout her indoor rooms. 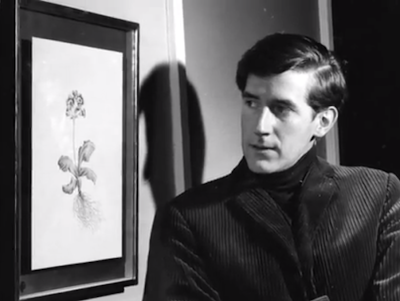 There are also artist's representations of plants on her walls and floral fabrics at every turn. 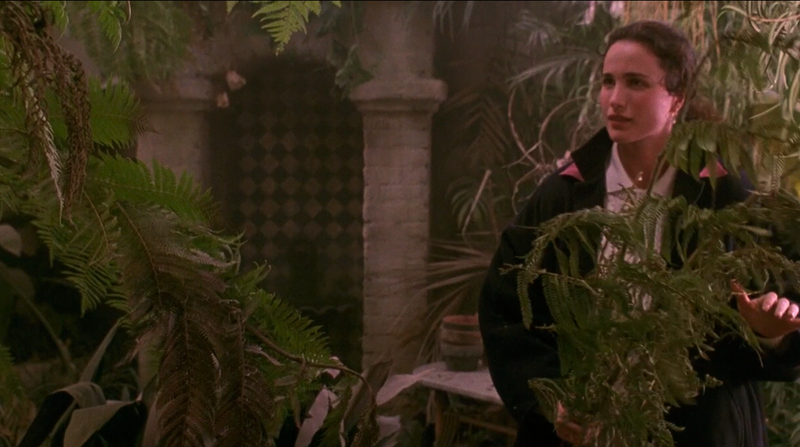 If you're zeroed-in on the jaw-droppingly-beautiful conservatory, you may not notice, on a conscious level at least, exactly how much botanical imagery is used by production designer Wendy Stites and her team. 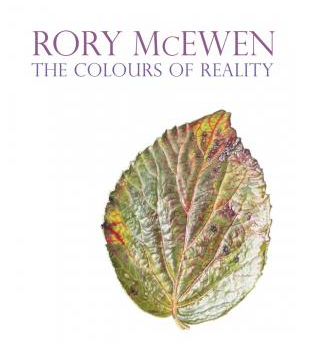 On view at Kew through September 22 is Rory McEwen: The Colours of Reality, a look at the musician and artist's almost photo-realist paintings, sketchbooks and collages. 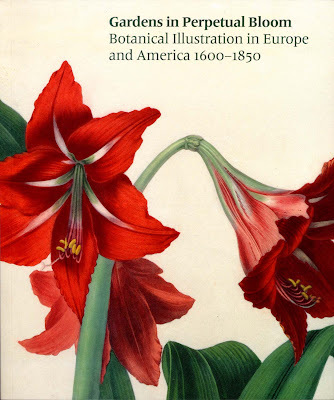 For those of us who won't make it to the UK to see the show in person, there's a beautifully illustrated catalogue. 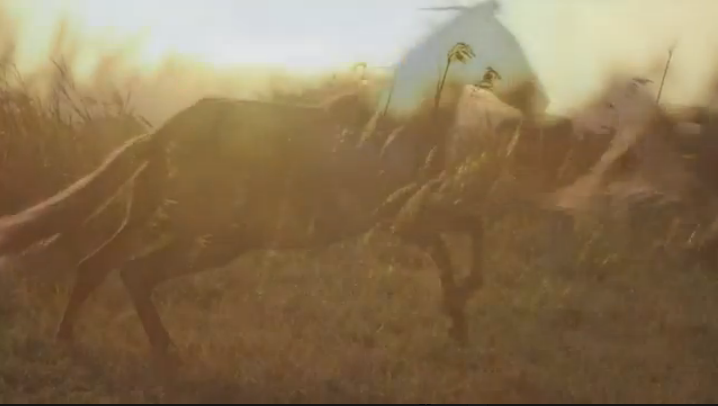 And a short video here. 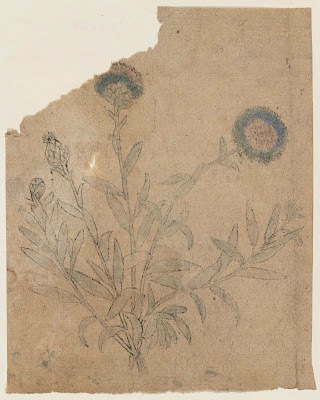 This 19th-century Indian watercolor is not currently on view at the MFA, Boston, but the Museum has myriad other floral-themed pieces out in its galleries. Objects like this 16th-century Vietnamese elephant-shaped ewer, which appears to me to be flower-covered. Another 16th-century Vietnamese ceramic, this softly-colored blossom-rimmed dish was included in the MFA's 2007 show, The Elephant and the Lotus. 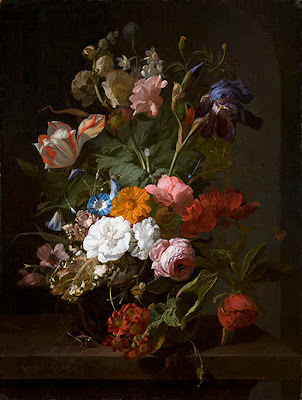 On the European front, the Museum owns a lavishly executed, naturalistic floral painting by Dutch master Jan van Huysum. Starting June 23, visitors to Atlanta's High Museum of Art will have a chance to see court painter Rachel Ruysch's approach to flowers. 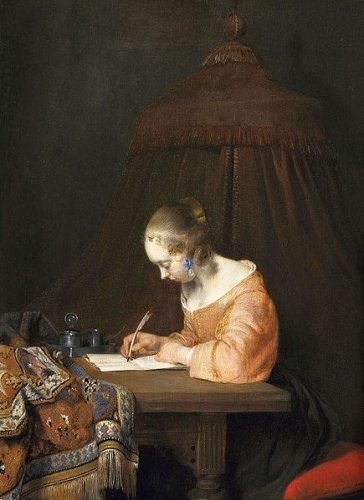 One of her works is included in Girl with a Pearl Earring: Dutch Paintings from the Mauritshuis. I'll confirm this tomorrow, but I believe visitors will find in the High shop Ruysch post cards to take home and tack to the wall a la Bronte. 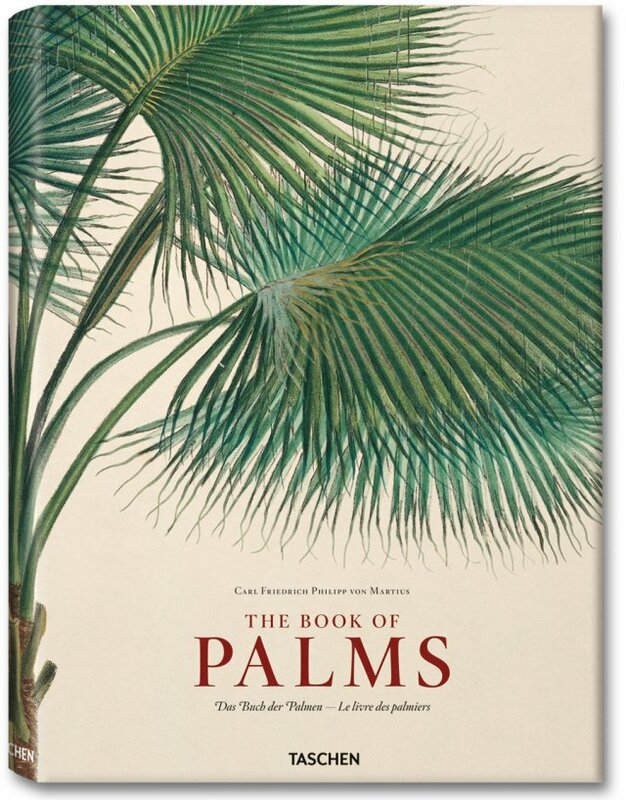 Taschen has influential 19th-century botany professor, Carl Friedrich Philipp von Martius's folio, The Book of Palms. 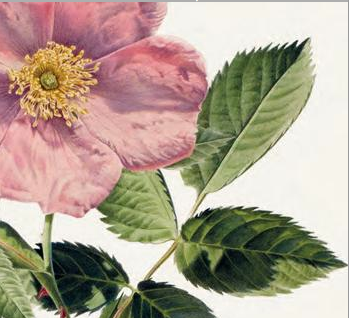 While the MFA offers Gardens in Perpetual Bloom, a study of centuries of flowers depicted in art by Pierre-Joseph Redouté and others. In the Northwest, Jennifer Ament builds on the tradition with her Earthly Delights series of hand-carved, hand-printed linocuts. 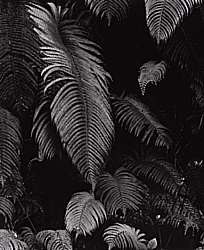 Shifting to the Midwest, The Nelson-Atkins has a collection of Brett Weston's botanical photography. 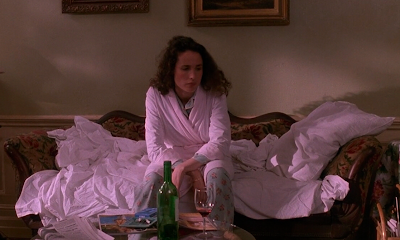 And if anyone ever does a Green Card remake, I nominate Stella McCartney to consult on costume design. Her mix of feminine florals and slouchy boy-ish pieces could suit a 2014 Bronte. I'm still gathering things for the floral-imagery-in-Green-Card post but had to pop in for a brief reminder: Memory Palace -- the V & A's provocative new show that asks visitors to imagine a world in which collecting, recording ideas and feelings, reading, and all sorts of art-making are forbidden -- opens June 18. 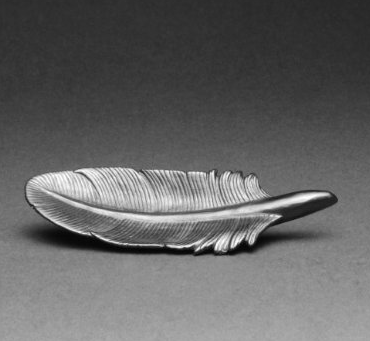 In conjunction with the exhibition, the Museum shop is stocking sculptor Agelio Batle's graphite feather and butterfly. 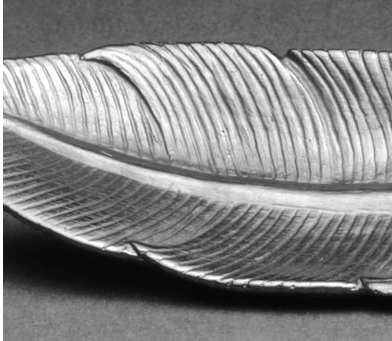 Hand-carved in San Francisco, Batle's pieces are functional; any part of the surface can be used as a drawing implement. But apparently the smudge-resistant, pressure-fused graphite won't stain your fingers. As tempting as it would be to keep this lovely feather in-tact, I guess the point is to get creative with it. At the moment I'm gathering images for another Green Card post. Visually, the film's most memorable element is undoubtedly the apartment conservatory in the real life late-19th-century building designed by Henry Anderson. But there're other aspects worth studying. 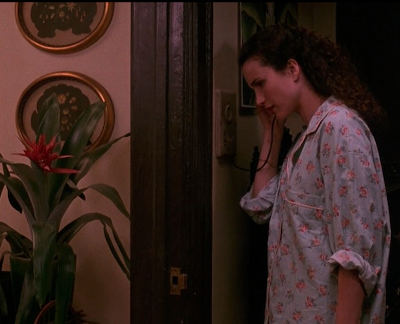 Representing the transition from the 1980s to the 1990s, the movie's set decoration embraces all things botanical, including floral prints. 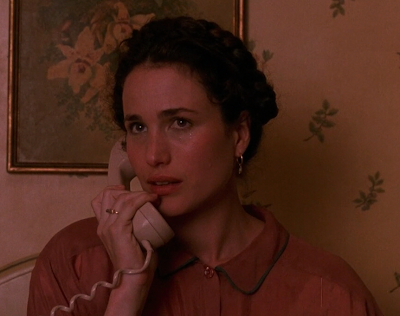 So the look and feel resonates again in 2013 (it's even got the braids and looser, wilder hair). In the meantime, if you want to watch it start to finish, it's finally available to rent through iTunes. 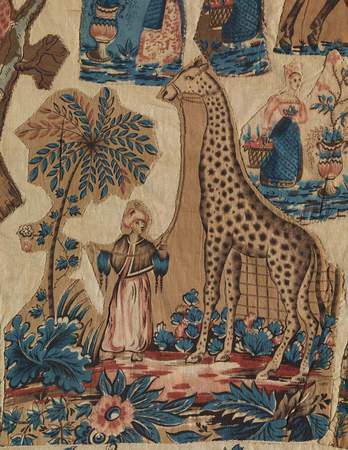 It's been nearly six years since I mentioned Zarafa, that remarkable Ethiopian giraffe captured as a baby and presented by Mohammed Ali, the Ottoman Viceroy of Egypt (1804-48), to France’s King Charles X during the 1820s. 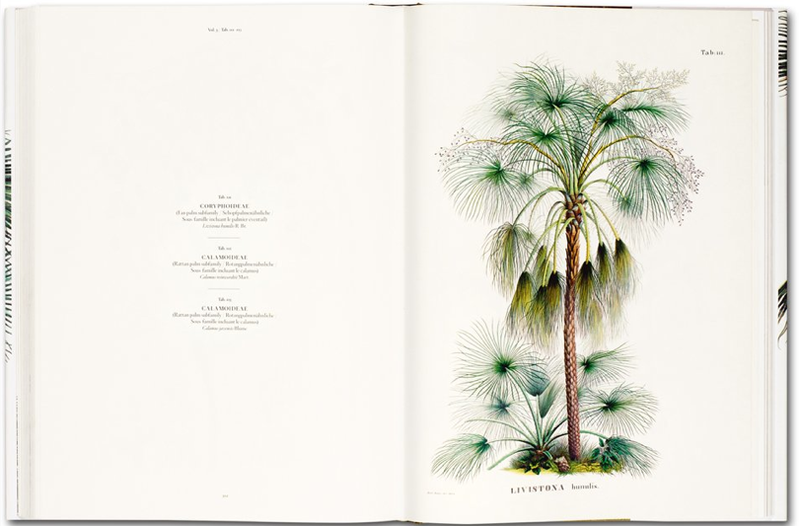 On her long journey to Paris, she traveled down the Nile then to Marseille, ultimately trekking by foot to the bustling French capital where she took up residence at the Jardin des Plantes. Throughout her life, Zarafa's image was replicated on all sorts of material goods from ceramics to textiles. 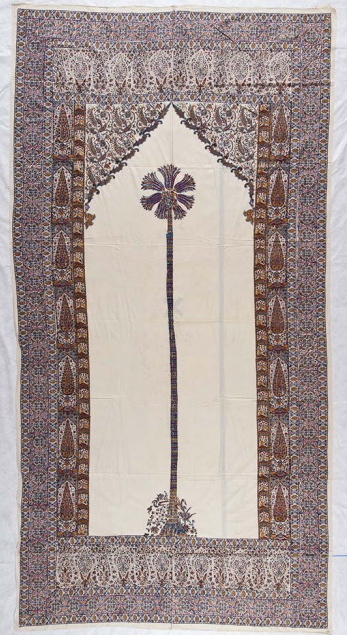 Currently on view at the de Young is one of these 19th-century pieces, a cotton bedcover block-printed and appliquéd, surprisingly not in Europe or India but in the U.S. You can see Zarafa is depicted with the Sudanese handler who traveled with her and remained in France, Atir. 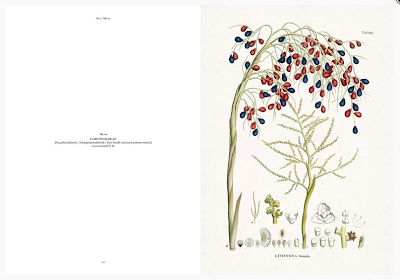 In conjunction with their exhibition, From the Exotic to the Mystical: Textile Treasures from the Permanent Collection, the San Francisco museum recently posted details on Zarafa's life as a French phenom accompanied by images of the bedcover and other illustrations. 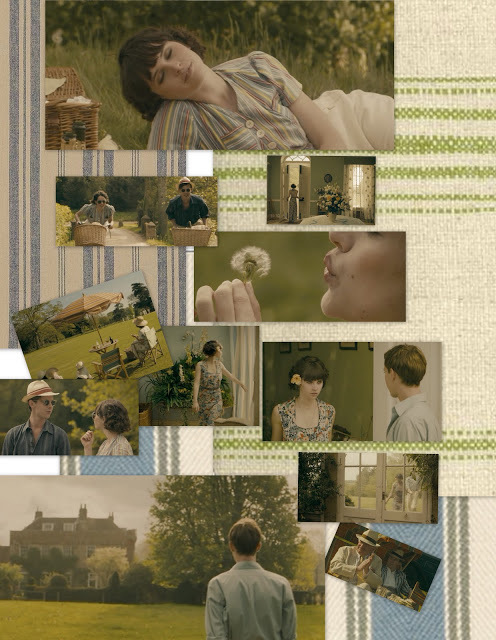 Baby it's green outside. Whether you're driving or strolling down Atlanta's streets in June, you're probably under a canopy of verdant leaves. 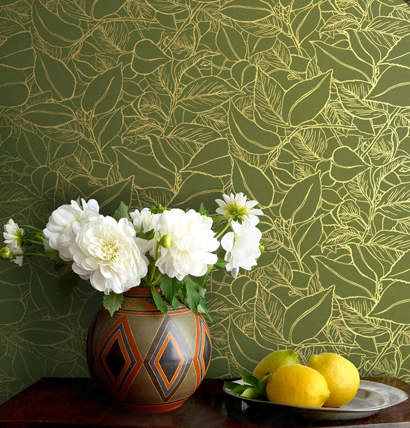 Although based across the country, in Los Angeles, boutique wallpaper company Lake August has a design that captures this feeling: Garden Wall in olive. 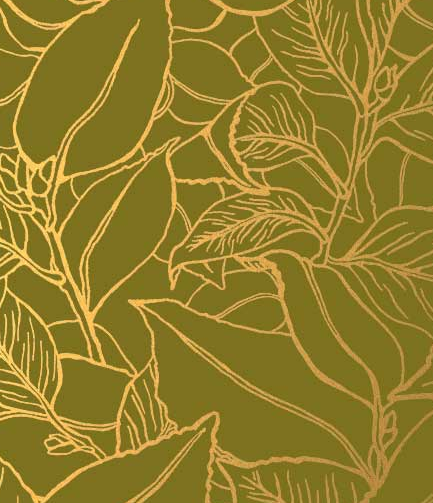 It's hand-drawn and then hand-printed in the U.S. with waterbased inks on recyclable paper. 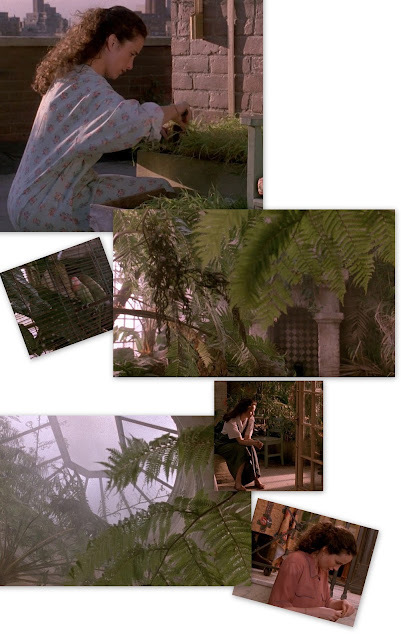 Don't have an apartment conservatory like Andie MacDowell's in Green Card (my 90s nostalgia run continues) or a Patrick Blanc-designed vertical garden like Laura Vinroot Poole's at Capitol in Charlotte? Bring in the vibe with paper. Those undulating lines running through the densely-patterned Garden Wall are metallic, by the way. Viennese artist Gustav Klimt is so associated with gold -- known for his shimmering 1907 portrait of Adele Bloch-Bauer and, of course, Kuss, aka The Kiss. But along with his now iconic figures there are also his less-famous paintings of parks and trees. Klimt frequently studied summer greens, from deepest emerald to light apple, during escapes to the country. 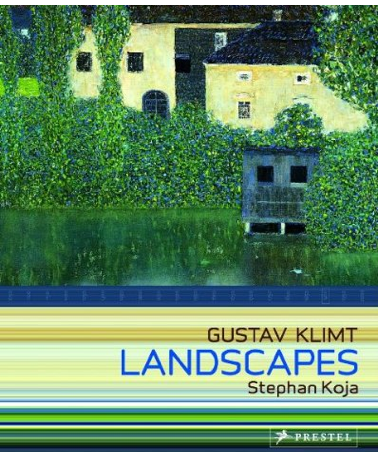 About ten years ago, the Clark Institute hosted the first exhibition to explore just this smaller body of mesmerizing work, Gustav Klimt: Landscapes. 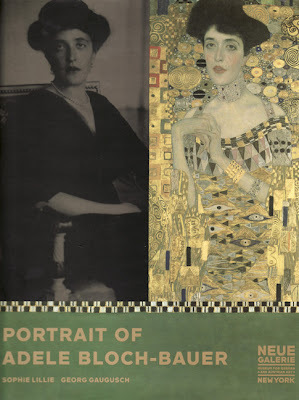 The catalogue is available at Neue Galerie's shop, as are many Klimt-related books and DVDs including Adele's Wish, the story of the aforementioned portrait, once seized by the Nazis, and its long controversial journey to the States. Learn more about Ronald Lauder's Neue Galerie, home to the Bloch-Bauer portrait, here. And don't forget Facing the Modern: The Portrait in Vienna 1900 is coming to London's National Gallery October 2013.